That’s why we created the Singularity offline screen. Having Singularity as your Twitch offline image could very well be the closest thing you get to experiencing the same time-bending adventure that Matthew Mcconaughey went on in the movie, Interstellar. Or you could just drop a couple of mushrooms… we won’t judge. Either way, make your Twitch channel look SPECTACULAR with Singularity – grab it today! Customize the colors to whatever you want. Add or remove any social media profiles. Replace USERNAME with your gamer name. 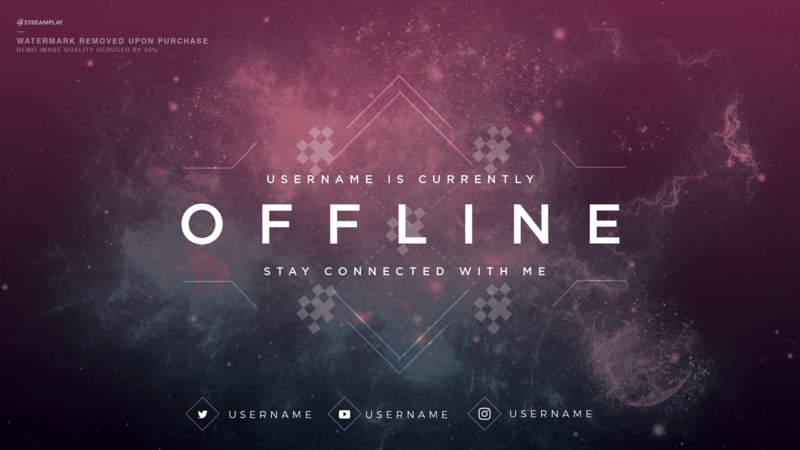 Include any custom text you want to truly personalize your offline screen. 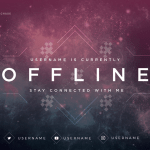 Like how this offline image looks? Their Customer Service was awesome, and their service was super fast. They accommodated all my odd requests and communicated with me when i had questions. Thank you again! Worth the price 10x over. The staff at StreamPlay were super accommodating. Fixed everything to the way I liked and even a week later when I requested an additional panel the gentleman did it with no questions asked. As I get more followers on Twitch I will 100% be coming back for more overlays. (Plus, this offline banner looks sexual af). Love the colours, looks awesome! They deliver exactly what you ask and pay for. Bought the offline banner asking for some customization and they exactly delivered what i wanted in two days. Came out Perfect, can’t wait to put it up thanks Streamplay! got what i asked for and the communication was great! will come back for more graphics! Everything was fast, simple, and just the way I wanted it to be. Worth every penny. I’m new to streaming, and I’m working hard to make my stream feel like my own personal project. StreamPlayGFX did a great job customizing this product to what I wanted and were extremely friendly. 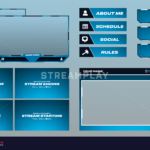 I know if I ever need another overlay for my stream this will be the first place I stop. 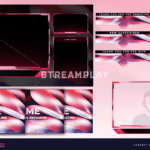 I wanted to make my stream stand out by having a solid look to it. I am a Star Citizen streamer so i found this to be a perfect way to stand out a bit and offer a clean look. Singularity is Everything I Needed. While I am no expert in the streaming world and only started a few days ago, having this offline image just makes me feel like I have a nice professional look to my page to get me started. I got this sent to me very fast with helpful service to get everything sorted out so that I had a product I thoroughly enjoyed!